Just one plant will give you a bountiful harvest! Unique purple colour and outstanding, sweet, intense flavour. Unusual, vigorous, clump-forming habit - ideal for border or patio container. This rich-purple-coloured raspberry forms a clump of vigorous, semi-erect, spine-free stems, ensuring that just one plant will give you lots of superbly flavoured fruit from mid June to the end of August! 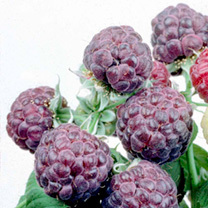 Raised by the Scottish Crop Research Institute, it is remarkable for the intense colour of its fruits, and even more so for the exceptional flavour. It is perfect for all dessert uses and especially good for jams, preserves and sauces, as the flavour is so intense. Ideal for growing in the fruit garden, at the back of a shrub border, or in a large container on the patio. Supplied in a 2 litre pot.